The holiday season brings families and friends together, but also causes worry around “what to say to each other.” I wanted to share details around a new, poignant spot from Verizon and cross-cultural creative agency the community that addresses how the words we share can bring us closer to the people we love. 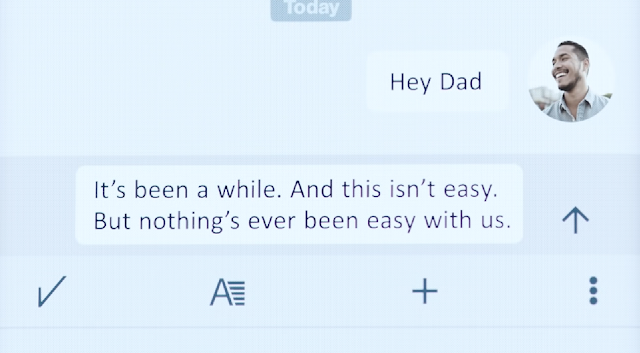 “Thanksgiving Moment,” which aired during Thursday’s Macy’s Thanksgiving Day Parade, shows a text message conversation between father and son. The exchange grows increasingly vulnerable as the son addresses their relationship, as well as his dynamic with his own son has shed light on it. The ad ends with the familiar image of ellipses as the father types his response followed by a reminder that, once you find the words, Verizon will make sure they get there.